The main innovative aspect of our AIVA 9001 software is that it can be easily adopted and customized according customer products, which are produced in single or small quantity. 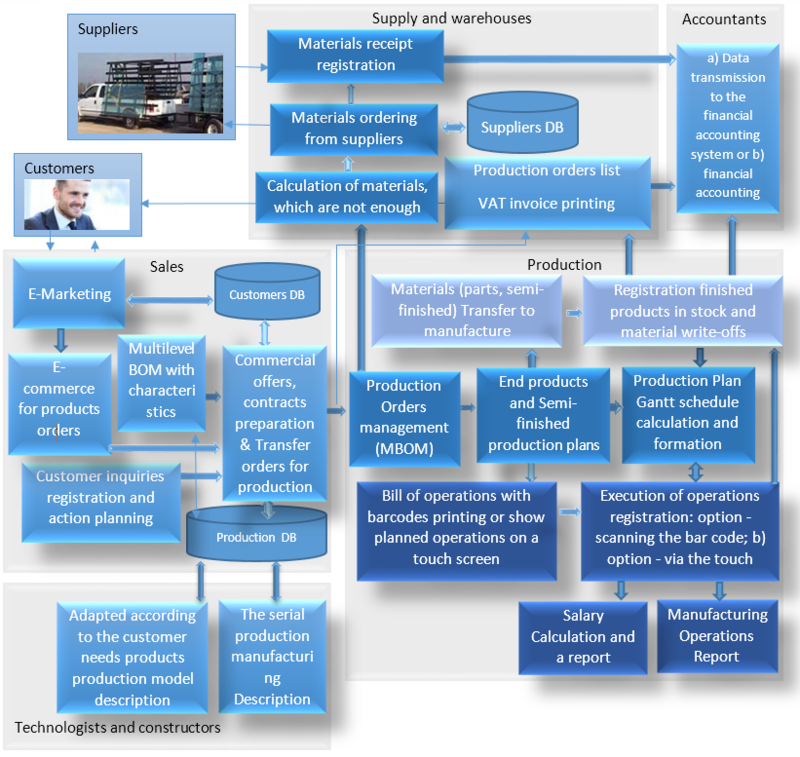 The management processes which can be automated and their connections are shown bellow in the picture. Even prominent production management systems do not have this feature, which is contained in AIVA 9001 – an easy adaptable (customization) to any non-standard production. This has been achieved by implementing an original systematic solution in the program database of the production modelling system, as well as by importing the data from the design programs. Therefore, it considerably speeds up the procedures of pricing of the non-standard products and product submission for manufacturing processes. Program AIVA 9001 contains the active Customer Relationship Management (CRM) system, which includes establishment of database of the actual and intending customers, e-marketing system of newsletters about new products and services, registration of all customer inquiries, planning and plan monitoring of contacts with the customers. AIVA CRM system will assist in finding new customers and receiving more orders from the actual customers. AIVA 9001 allows to estimate the non-standard production costs and prices, prepare offers and contracts, transfer the orders to manufacturing unit and calculate the managers' salaries on the basis of their personal sales. This feature will increase the productivity of the managers several times and help to sell more products. Using the database of AIVA 9001, a website with e-commerce system can be structured, which will ensure a better service to your customers by showing a progress in carrying out the customer orders online. Your customers will be able to order even non-standard products on the website, and their orders will go directly to the manufacturing unit. This feature will help you sell more to the existing customers. Introduction of barcode system and touch-screen computers of AIVA 9001 in order to manage the manufacturing operations will allow the creation of real-time reports on progress of the manufacturing orders, as well as the implementation of a staff pay system depending on their manufacturing operations tasks and also to increase staff and production efficiency. Planning system of AIVA 9001 will schedule a production plan for each work, display it in the Gantt chart and indicate the dates of implementation of the customer orders, denoting a “narrow” (limited-capacity) production chain, which you can quickly solve by removing this “bottleneck” in production and execute the customer orders on the lowest costs and in the fastest way of performance.